Diameter: 16mm (5/8in). Cutting Depth: 41mm. 5.5 TPI/25mm tooth form. New t.. Diameter: 60mm (2.3/8in). Cutting depth 51mm. New tooth material for enhanced hea.. Diameter: 17mm (11/16in). Cutting Depth: 41mm. 5.5 TPI/25mm tooth form. New.. Diameter: 64mm (2.1/2in). Cutting depth 51mm. New tooth material for enhanced hea.. Diameter: 57mm (2.1/4in). Cutting depth 51mm. New tooth material for enhanced hea.. Diameter: 70mm (2.3/4in). 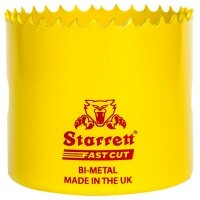 Cutting depth 51mm. New tooth material for enhanced hea.. Diameter: 76mm (3in). Cutting depth 51mm. New tooth material for enhanced heat an.. Diameter: 54mm (2.1/8in). Cutting depth 51mm. New tooth material for enhanced hea.. Diameter: 25mm (1in). Cutting depth 51mm. New tooth material for enhanced heat an.. Diameter: 79mm (3.1/8in). Cutting depth 51mm. New tooth material for enhanced hea.. Diameter: 20mm (25/32in). Cutting depth 51mm. New tooth material for enhanced hea.. Diameter: 95mm (3.3/4in). Cutting depth 51mm. New tooth material for enhanced hea.. Diameter: 40mm (1.9/16in). Cutting depth 51mm. New tooth material for enhanced he.. Diameter: 14mm (9/16in). Cutting Depth: 41mm. 5.5 TPI/25mm tooth form. New .. Diameter: 140mm (5.1/2in). Cutting depth 51mm. New tooth material for enhanced he..